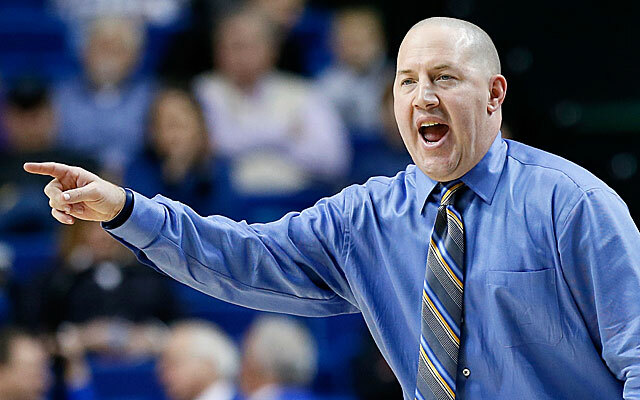 New Faces, New Places: Why did Buzz Williams leave Marquette for VT? The most surprising move on the coaching carousel was Buzz Williams' departure from Marquette to Virginia Tech. But it actually makes sense when you think about it the way Williams thought about it. BLACKSBURG, Va. -- We were sitting at Waffle House, the one by campus, a few minutes after individual workouts on a Thursday morning, picking at eggs and bacon and whatever else the waitress put on our plates, when I asked Isaac Chew the question everybody asked me any time I mentioned I was heading to Virginia Tech to see Buzz Williams. Why did he leave Marquette for a historically bad job? Chew, the one full-time assistant who followed Williams from Milwaukee to Blacksburg, was seated to my right. The first thing he said in response to my question was the exact thing I expected him to say, and that thing was this: "People ask me that all of the time." I told him people ask me that all of the time, too. It's been three months since Williams surprised fans by leaving a prominent Big East program for a bottom-tier ACC program, and in those three months various people have offered various theories for not only why Williams did it but for why he actually took a paycut to do it. In fairness, most of the theories are laced somewhat in truth. But the truth is that nobody's ever fully explained it, and, before I can fully explain it now, I need to tell you about the list of Presidents of the United States that I saw on the first page of a diary that was sitting on Williams' desk in his office a little later on that Thursday afternoon. The diary was labeled "September 2013." On its pages was basically everything Williams thought about in September 2013. There was one page where assistants' salaries were detailed, another with some ideas for team rules. There were pages filled with Bible verses, inspirational quotes and just random thoughts in general, and it really was something straight out of Rainman. Still, most everything on those pages made sense. But why in the world were the Presidents' names listed? "I decided I wanted to memorize the dates that all of the Presidents were in office," Williams answered. "And I wanted to memorize the order of the Presidents." "You don't think people ought to know the Presidents?" Williams asked. I laughed and told him that, in theory, I suppose it's good to know the Presidents. But I also pointed out how I thought it was strange that he had randomly decided, in September 2013, at the age of 41, as a multimillion-dollar basketball coach, to learn the Presidents by writing them down in a notebook like a fifth grader, at which point Williams held up the diary and explained that he has one for every month of his life since he was a kid. Then he showed me another piece of paper and pointed at some words. "Look at this," Williams said. Here's how it read: "Make decisions from a balanced perspective. The best decisions are based on facts and data. The person with the best info wins nine out of 10 times. The next 12 months is an information-gathering mode." Buzz Williams scribbled those words one day in the same spirit with which he documents basically every thought of every day, and, when you get right down to it, those are the words that guided him from Marquette to Virginia Tech because those are the words that consumed him just like each thing that enters his mind seems to consume him. "The way Buzz thinks is different," Chew said. "He just thinks differently." "I'm weird," Williams said while acknowledging that, yes, it's likely an undiagnosed case of Obsessive Compulsive Disorder. "I have an insatiable thirst for information." Which brings me back to that list of Presidents. One day, as the story goes, Williams heard the national anthem, and it occurred to him that he could not name the 44 Presidents in order or at all, and, just like that, he was consumed with learning them to the point that he literally wrote a list and started studying. Once he realized he didn't have that information in his head, and once he decided, for whatever reason, that he needed that information in his head, he was not going to be able to relax until he mastered that information, and, shortly thereafter, he could, off the top of his head, name every President in order and explain in great detail why Grover Cleveland is both No. 22 and No. 24 on the list because, once he realized Grover Cleveland was both No. 22 and No. 24, Williams read everything about that, too. Why he left Marquette is rooted in similar stuff. Simply put, once Williams decided to go into what he called an "information-gathering mode," his mind wouldn't rest until he had more data than you can imagine. He projected the likelihood of basketball programs not connected to football programs flourishing over the next 10 years in this ever-changing climate of college athletics. He studied how many programs succeed at a high level without some sort of ESPN contract. He estimated whether it was reasonable to expect the next six years at Marquette would duplicate or exceed the previous six. He researched every coach who has been at a high-major program for at least eight seasons to the point where he learned that staying in the same place too long in this era -- especially when you'll be inheriting a new athletic director soon, like he would've been at Marquette -- proves to be a mistake more often than not. Williams took an honest look at his career from every angle. He was consumed with collecting the data that led to his decision to leave Marquette. And, honestly, it wasn't as hard of a decision as most apparently think. How proud he was of the wording of certain clauses. How he regularly talked about the day he'll eventually be fired. This, to me, was fascinating because I've never seen a coach care so deeply about contract terminology, if only because most have agents who handle such things. But what I later learned is that Williams does not technically have an agent, that he actually negotiates and even writes large parts of his contracts, and that he learned to do this by filing Freedom of Information Act requests with public universities. He would obtain contracts of football and basketball coaches, study them intensely and highlight things he liked and didn't like. "I have stacks of contracts," Williams said. "Stacks probably as big as this desk." Which came in handy in March. "When we were talking in, for lack of a better term, the interview phase, he gave me a list of ... I don't know ... 20 questions, maybe, it was unbelievably detailed -- everything from the shoe contract to camps to admissions," said Virginia Tech AD Whit Babcock. "He wanted to know how [Virginia Tech football coach] Frank Beamer does this or that. When I got the list, I was like, 'My goodness. This is going to take a while.' But I was very impressed. He had done an incredible amount of homework, and he wanted even more information." The second interesting thing was how often Williams began a sentence in that meeting with the words "when they fire me" because I've never heard a coach, particularly a successful one who has never been on the so-called hot seat, speak that way, especially not a coach with a fresh contract. And yet he said it over and over again. When they fire me. When they fire me. When they fire me. Again, this offered a glimpse into the way Williams thinks and his obsession with data. He knows, because he's done all of the research, that almost nobody who enters this profession works as long as they want and retires without a nudge, and so he's forever planning for the day he'll be fired. It's not a defeatist attitude because Williams is a confident person. It's just that his entire view of the world is rooted in "facts and data," and the facts and data suggest he'll eventually be fired like pretty much everybody else. So he obsesses about it and plans for it while trying to put it off as long as possible. Was Williams in trouble at Marquette? He made five NCAA Tournaments (in his first six seasons), advanced to the Sweet 16 three times and the Elite Eight once before the age 40, and most young coaches would become intoxicated with that success. Not Williams, though. He instead identified it as the bar set, then assembled "facts and data" in an attempt to determine whether it was reasonable to expect to maintain that level of success in a less-attractive Big East while playing league games off of ESPN and on Fox Sports 1. He concluded it probably wasn't. And what would happen if he didn't? Answer: Williams would fall out of favor with his own fans the same way Ben Howland once did at UCLA, the same way most coaches who stay too long at any basketball-centric school eventually do. Consequently, Williams determined it was wiser to jump while he was still ahead, and though his contract at Virginia Tech is technically for less money on a per-year basis, it's a seven-year deal with an automatic rollover clause that will never allow it to be less than a five-year deal, meaning the security provided makes it a better deal for a man openly planning for the day he's fired. Beyond that, the bar he set at Marquette no longer exists. He has a fresh contract and fans with fresh sets of expectations. Williams' move ensures he doesn't have to make three Sweet 16s over the next six years to prove to the world he isn't slipping. He's now in charge of a program that's been to exactly one NCAA Tournament since 1996, that's made just one Sweet 16 ever, and that won a mere two ACC games last season. In other words, the bar is really, really low. And Williams is more likely to spend the next six years outperforming his predecessors at Virginia Tech than he would've been to spend the next six years outperforming himself at Marquette. Or, at least, that's what the "facts and data" assembled suggest. "I'm the first coach Buzz ever met," said Steve Roccaforte, and I later double-checked this story with Williams. "That's right," Williams said. "Rock was the first college coach that ever gave me any gear. He was at Centenary. It was a white T-shirt. Maroon and white. It was sponsored by Pizza Hut. So it had a Pizza Hut logo on it." This has forever meant something to Williams because he isn't a former college basketball player who had natural connections to the coaching profession. He was just a junior college kid who decided he wanted to be a college basketball coach, and so he spent his college years writing letters on a weekly basis to a list of coaches that eventually reached 425 in an attempt to make contacts that could hopefully open some door somewhere someday. Williams appreciated that; they've become close friends over the years. And when Roccaforte was fired as the head coach at Lamar after the 2010-11 season, Williams was one of the few coaches who actually picked up the phone and called. "My wife asked, 'Is your phone broke?" Roccaforte said. "For 25 years that thing rang off the hook at all hours. Suddenly, it's silent. But Buzz called." Few hours later, somebody from Williams' office at Marquette also called. "And they said, 'Here's your flight information and confirmation number,'" Roccaforte said. "Next thing you know, I'm on a flight to Milwaukee." From there, Williams and Roccaforte flew privately to a coaching clinic in Charlotte. Then they returned to Milwaukee for a day before flying to, and attending another, coaching clinic in Las Vegas. They ate every meal together. They shared hotel rooms. And when Stan Heath, then the head coach at South Florida, had an opening on his staff, Williams picked up the phone and lobbied for his friend. "Buzz knows how much I wanted to be a head coach, and he knew how bad it hurt to get fired," Roccaforte said. "Nobody else cared. You know, 'It's just part of the business. Happens every day.' But Buzz knew how I felt, and he just wanted to make me feel better." This is not an isolated story. When Steve Forbes was fired as part of Bruce Pearl's staff at Tennessee, Williams picked up the phone and offered to pay his friend's mortgage in Knoxville until things turned around. When Marquette fired one of Williams' assistants, Scott Monarch, in 2012, Williams personally supplemented Monarch's income until he landed a new job at North Texas that Williams helped him get. And it's not a coincidence that Williams has always had a fired coach on his staff in some capacity, whether it be former DePaul coach Jerry Wainwright last season or former Air Force coach Jeff Reynolds this season. He holds fired coaches in high regard because, on some level, he figures he'll probably be one someday, too. "It meant so much to Buzz to get a start in this business, for people to help him, and he's never forgotten that," Roccaforte said. "He's got a good heart -- a really good heart." Roccaforte, by the way, now works for Williams at Virginia Tech. USF fired him, along with Heath, back in mid-March. Less than a month later, Williams scooped him up. When I finally looked at my phone I realized Buzz Williams had been talking for 85 consecutive minutes about everything from his obsession with advanced stats to this one saying about how what's in a bottle when tipped over will come out, and, by this point, I had seen enough of his diaries to know that he's genuinely documented every dollar he's ever earned since he was a child complete with details about whose yard he mowed, how many bales of hay he carried, how many hours he worked for a plumber, and the number of days he worked at a donut shop. Quite clearly, his mind is wired in a way that forces him to write down everything all of the time so that he can take stock of everything all of the time, and, yes, he recognizes this is not normal and actually kind of weird. Still, he knows how he compares to every other coach his age. He knows how he compares to every other ACC coach. He knows everything about Virginia Tech. It's all in the pages of these diaries. Like he said, Williams has an insatiable thirst for information, and practically every decision he makes is made from a "balanced perspective" guided by what that information tells him. So when people question why he left Marquette for Virginia Tech, he just assumes they didn't take the time to really think about it from every angle the way he really thought about it from every angle because, if they did, he figures those people would understand. And if they wouldn't, well, that's OK, too. Not everything Williams does has to make sense to everybody. It just has to make sense to him. Which is why, on a random day in September 2013, he decided he needed to learn all of the Presidents of the United States, and it never mattered to him that the overwhelming majority of Americans would view this as a strange waste of time. Once it was in Williams' head, he was consumed with it as much as he was once consumed with the future of the Big East and his career trajectory at Marquette, and now he knows just as much about Grover Cleveland as he knows about Al McGuire. "See, it goes Grover Cleveland, then Benjamin Harrison, then Grover Cleveland," Williams said. "Grover Cleveland did it twice. He's the only President that you count twice."